This retail suite includes core applications (Word, Excel, PowerPoint, OneNote), plus Outlook. You don't need to purchase a physical license. What you buy is just the License Key because that's all You needs! 100% Working: The CD-Key is a lifetime license! Brand new & original. No matter what help you may need with downloading or installing Office 2016, we've got the expertise you need. We'll give you the support you need until your software is up and running. Microsoft Office 2016 Home & Business for Mac — What Is New and Different? Real-time co-authoring: The capability to work on the same document simultaneously on SharePoint or OneDrive without overwriting each other's changes comes to the Word 2016, PowerPoint 2016. Simplified document sharing: If your Word 2016, Excel 2016 and PowerPoint 2016 saved in either SharePoint or OneDrive. The "Share" button lets you share access to the document to your team members. 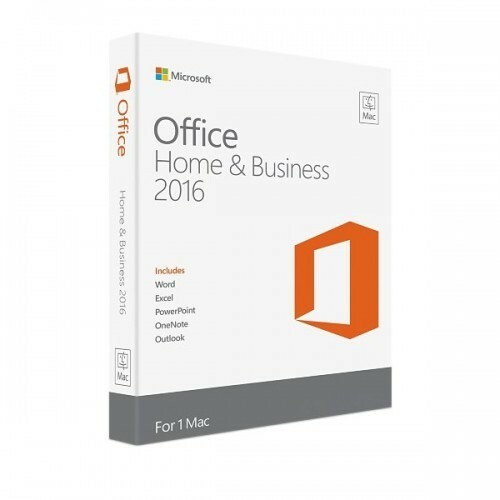 Improved versioning: For files saved on SharePoint and OneDrive for Business, Office Home & Business 2016 allows you to view historical versions of Office files directly from within Word 2016, Excel 2016 and PowerPoint 2016. Smart Lookup: Smart Lookup allows you to highlighting a word and selecting “Smart Lookup” from the context menu to quickly pull up some related information without having to leave your Office 2016 app. New chart types: Microsoft added a bunch of new charts (Treemap, Waterfall, Pareto, Histogram, Box and Whisker, and Sunburst) to Word 2016, Excel 2016 and PowerPoint 2016 that should help users to do a better job when it comes to visualizing financial or hierarchical data. One-click Forecasting: Excel 2016 will appreciate the ability to create a forecast from available data with ETS algorithm. This making it easy to derive quick and dirty projections with the click of a mouse. Stronger cross-device support: Office 2016 denotes a fundamental step forward a new world of cross-platform support with smooth integration spanning across both platforms and apps than ever before. Office Groups: Groups allow the user to create specialized groups in Outlook 2016 and then apply those groups to other Office applications for collaboration. Required video card: 1280 x 800 screen resolution or higher. Required connectivity: Internet functionality requires an Internet connection.